This is static website. This website is having different look and feel. Website is giving information about Hotel but in a slightly different style. Here you will find pages like Welcome Page, Gallery Page, Tariff Page ,Services Page and Contact Page. 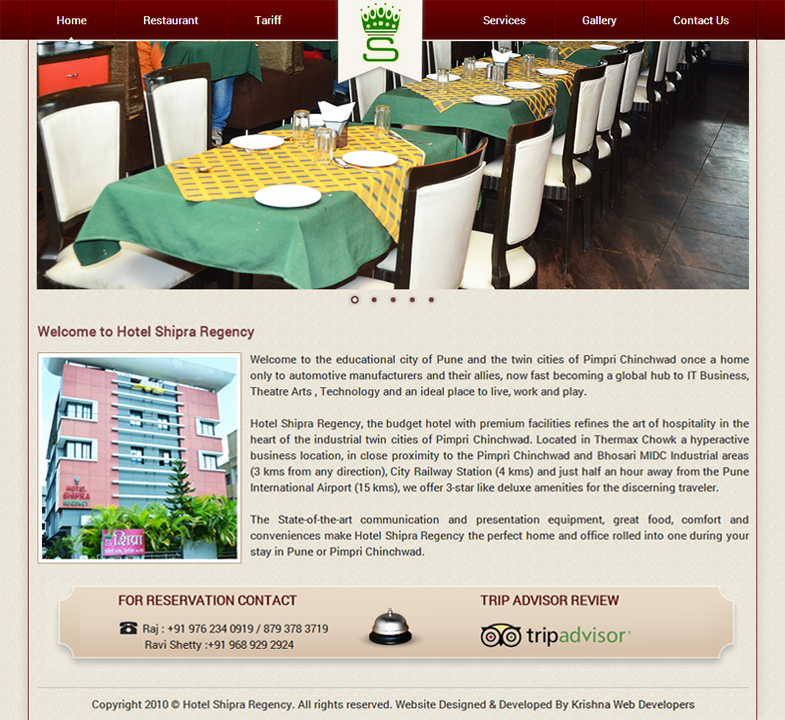 Hotel Shipra Regency, the budget hotel with premium facilities refines the art of hospitality in the heart of the industrial twin cities of Pimpri Chinchwad. Located in Thermax Chowk a hyperactive business location, in close proximity to the Pimpri Chinchwad and Bhosari MIDC Industrial areas (3 kms from any direction), City Railway Station (4 kms) and just half an hour away from the Pune International Airport (15 kms), we offer 3-star like deluxe amenities for the discerning traveler.